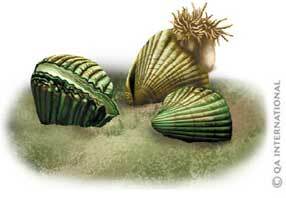 Shore fauna: vulnerable but tough! The coast, or shore, is the zone subjected to breaking waves and the coming and going of the tides. At low tide, the ocean floor, normally covered by water at high tide, becomes visible. Shore inhabitants have developed a number of strategies not only for hiding from predators, but also for withstanding the waves and tides that alternately submerge them and dry them out. On the sandy coasts, animals hide under the wet sand. On the rocky coasts, seaweed and animals cling to stones or hide beneath them. The coast is populated by crustaceans and mollusks that have multicolored shells, as well as a multitude of marine birds that wade in the water in search of food. It is a fragile living environment, vulnerable to stresses linked to human activities such as oil spills, pollution, urban sprawl and the construction of industries and tourist resorts. Marine farms are enclosures anchored in coastal waters, where marine organisms are raised. Salmon and shrimp are the principal animals raised in marine farms. Most of the oysters and mussels people consume are raised in baskets, on ropes or on wooden posts set up close to shore. Marine farms have many advantages. For example, they prevent wild populations from becoming depleted as a result of overfishing. 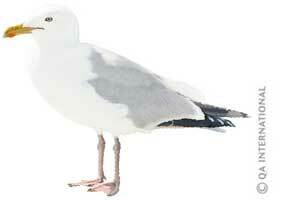 However, they also present disadvantages because they pollute and destroy certain coastal ecosystems. In many tropical countries, the mangroves have been destroyed in order to set up enclosures for fish or shrimp. 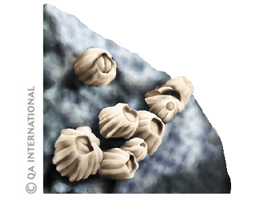 Innumerable periwinkles populate the rocky coasts. These small mollusks with colorful spiral shells creep along on their single foot, feeding on seaweed attached to the sides of rocks. Also called winkles, periwinkles are consumed just about everywhere in the world. Barnacles are small crustaceans that cling to rocks, the hulls of boats and even the bodies of other animals, such as whales. They are found in large numbers on the coast—there can be millions of them in 1 square kilometer! At high tide, barnacles feed on microscopic organisms suspended in the water. At low tide, the opening at the top of the animal closes to capture a little water. This reflex action prevents barnacles from drying out. Succulent plants, like cacti and spurges, are perfectly adapted to the aridity of deserts. They have water reserves stored in their stalk, leaves or roots and they are usually small. Some have leaves reduced to the size of needles, notably to limit water loss through evaporation and to protect themselves from animals. Long roots that spread out just beneath the ground’s surface allow succulent plants to collect every trace of moisture that can be found in a wide area. 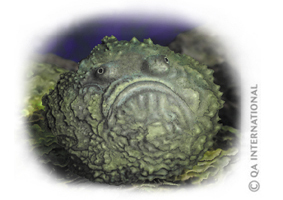 The stonefish inhabits the reefs and shallow lagoons of tropical seas, where it remains motionless, covered in seaweed and camouflaged among the stones. This fish, which grows to 40 cm, eats shrimp and fish. Its large mouth allows it to swallow its prey whole at lightning speed! Its dorsal fin is equipped with spines connected to venom glands, making it the most venomous fish in the world. The serpulid worm lives in shallow waters, inside a long protective tube about 10 cm long that is attached to the ocean floor. At high tide, this worm puts out its “feather duster” tentacles and feeds on plankton it filters from the water. 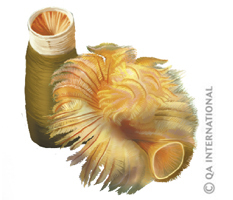 At low tide, it retreats into the calcareous tube it has constructed for itself, blocking the end with a flattened tentacle to avoid drying out. Mussels live in colonies on the rocky coasts. To withstand the breaking waves, they stay close together and attach themselves to rocks with strong filaments called byssus. At low tide, these bivalve mollusks close their double shell completely to preserve the moisture that is indispensable to their survival. 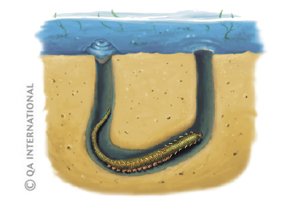 Buried under the sandy ocean floor, the cockle puts out its siphons, which are two tubes that it uses to breathe and to filter the water for the plankton it eats. This bivalve mollusk also uses its siphons like a periscope to survey its environment while remaining under the sand, hidden from its predators. The crab is a 10-legged crustacean. The first pair of legs have been modified to form sharp pincers. Its legs can grow back if they are torn off. There are thousands of species of crabs, some of which live on land and in fresh water. At low tide, numerous crabs on the seashore hide under stones or wet seaweed or in tide pools. Depending on the species and the environment, crabs may feed on seaweed, animal or plant remains, or other organisms, living or dead. 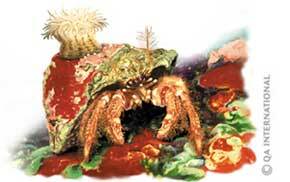 The hermit crab is not related to other crabs. Unlike them, it has a soft abdomen without a shell. 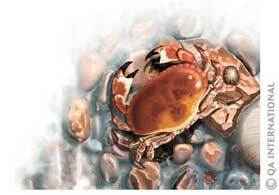 To protect itself, this crustacean slips into an empty shell, carrying it around on its back when it travels. As the hermit crab grows larger, it needs to find a new and more spacious dwelling. 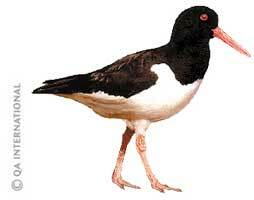 Few shellfish can withstand the oystercatcher. This bird’s long, thin beak is specially designed to open cockle and mussel shells. Inserting the sharpened tip of its beak, the bird opens the shell in one movement and devours the soft part of the mollusk that is hidden inside. The octopus, a cunning and clever animal!